Another rough week for iron ore. Last week it breached the previous low for the year, this saw it take out the 2012 low of $86.70, and tumble straight down for a close of $83.60. It’s now fallen in 14 of the past 15 sessions. For the year it’s down 37.7% in USD-terms, and 40.7% in AUD, due to the ongoing resilience of the latter. Sadly we can expect little respite from a falling AUD, thanks to the stubbornly lukewarm US labour market, the belated arrival of ECB easing, and a stampeding housing market preventing further rate cuts in Australia. There is much chatter these days about the starkly divergent paths of iron ore and the Aussie dollar. Intuitively this seems odd, after all iron ore is easily our largest single export, however it’s merely a loud reminder that the goods market holds little sway in the setting of nominal exchange rates; capital markets rule. As long as it’s relatively lucrative to borrow offshore and hold short-term AUD-denomiated assets, we aren’t likely to see a sustained fall in our currency. So we’re left to pour libations and pray for a swift rebound in spot prices. There is a strong precedent for this. At the moment the market is traveling in much the same way as it did during the 2012 destock rout, which was savage but short-lived. Are we likely to see a similar whipsaw this time around? I suspect not, for the following reasons. India knocked some 100m tonnes out of the seaborne market in late 2012 with its epic regulatory own-goal. That’s not there to disappear now. 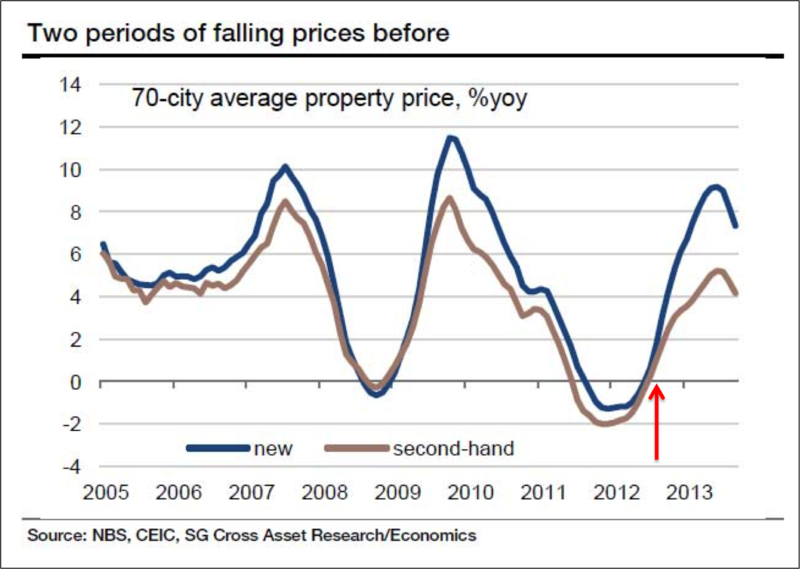 Stimulus via fixed asset investment flowed freely in 2012, and, critically, the property sector commenced a strong upswing around the time iron ore bottomed (see chart below). It is far less likely that the government will embark on a similar path this time, for reasons sketched out here. Targeted fiscal support is likely, but a rebooting of the heady investment boom is not. If this plays out, steel demand will be flat or falling, with deleterious consequences for the suppliers of the iron ore deluge. 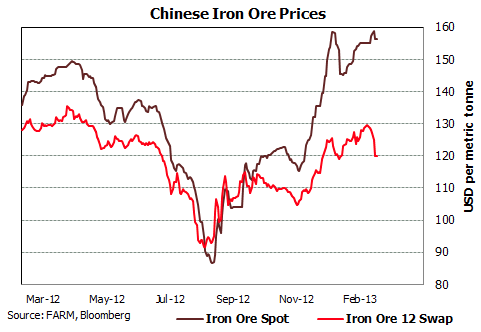 There is now an iron ore deluge. Inventories held by steel mills are low-ish at the moment, while stocks held at port most certainly are not. This appears to be a fundamental shift in the market, making an aggressive restock a la Q4 2012 less likely. We’ll see the price bottom out and rebound eventually, of course, but without a hasty U-turn in Chinese government policy (something that needs to be monitored closely), this decline in iron ore is structural. As I said last week; lower lows and lower highs until sufficient supply capacity drops out of the market to stabilize prices. 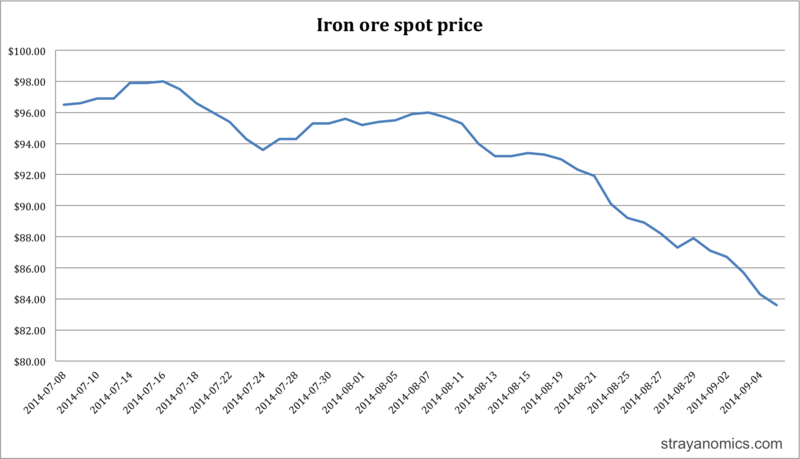 If demand for iron ore, which has so far remained robust, starts to turn, heaven help us. This entry was posted in Uncategorized on September 6, 2014 by MJV.